Track down nefarious art thieves in Insider Tales: The Stolen Venus. Just yesterday, art lovers from around the world were clambering for a glimpse of Botticelli’s masterpiece, “The Birth of Venus”, but today nothing hangs in its place but the empty frame! Help inspector Francesca di Porta hunt for clues to track down the villains in this mysterious hidden object game. 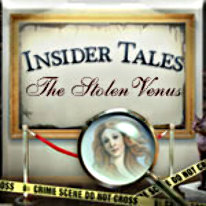 You’re on the case with Insider Tales: The Stolen Venus!